The writing on the wall is clear. 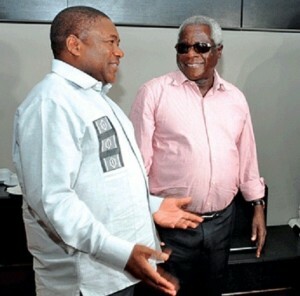 Mozambique will not enjoy peace as long as National Resistance Movement (Renamo) leader Alfonso Dhlakama is not in power. He is the type of leader who behaves as if he is a head of state for some provinces of Mozambique. His political wild demands are making the prospects of peace agreements in Mozambique slim. Currently, international mediators who have for months been brokering a peace deal between the government and Renamo have given up and left Maputo. Coordinator of the mediators, Mario Raffaelli told Mozambican News Agency (AIM) that they would only return if there was a formal invitation from the negotiating teams of the two sides. Renamo has been demanding elections of governors in the six provinces in which it says it won the most votes in 2014 elections. Despite making such a claim, Renamo won most votes only in five provinces and not six. Dhlakama, who is still camping in Gorongosa Forest, has said he wants to name six governors for the six provinces. The second demand Renamo is making is on the need to have a new integration of Renamo fighters into the army and police with some form of joint control. Africa’s security think-tank Institute of Security Studies (ISS) recently said a perfect storm is brewing in Mozambique as rocky economic and political fortunes stoke the embers of a decades-old conflict. Pretoria-headquartered ISS in its analysis titled “The Perfect Storm – Mozambique Compounding Crisis,” said while a relapse into full-scale civil war was a remote possibility, the violence showed no sign of abating. “[This is] suggesting continued hard times for Mozambicans,” reads the analysis in part published on its website. ISS said that the sporadic violence in the southern Africa nation is being fuelled by a complex web of political and economic incentives. ISS said the violence in Mozambique was escalating because the ruling party was divided and various factions had different strategies on how to deal with Dhlakama and his militants who have refused to disarm since 1990. According to the report, Nyusi has been opting for dialogue as a strategy to resolve the clashes between Renamo and government forces when many ruling Frelimo diehards and army generals wanted a decisive military action taken against Renamo. “…the economic crisis and military abuses by government forces simply strengthen Renamo’s stance that ruling Frelimo fails to represent the people’s interests,” reads the analysis in part. Mozambique which enjoyed peace for almost two decades after the end of civil war in 1992 is now witnessing political tensions and violence. Renamo resumed attacks on state facilities and civilians in 2014 following its defeat in elections. Armed Conflict Location and Event Data Project run by the University of Sussex in the United Kingdom estimates that over 300 people have been killed following the resumption of the insurgency. Meanwhile, continued attacks are disrupting transport links, the worst affected being mining companies and landlocked countries that use Mozambican sea ports for exports and imports. Just as was the case in Angola where the conflict ended when rebel leader Jonas Savimbi was killed, growing signs now indicates that Mozambique may enjoy ultimate peace either once Dhlakama is in power or is out of politics. How and when the veteran leader will find himself in power, or be given some powers or gets out of politics is something that Mozambicans do not know.